Crab apples (Malus spp.) range across most of the US and some Canada. They aren't found in Hawaii, Idaho, Arizona, and North Dakota in the United States. They're generally much more common in the Eastern and Central US. In Canada, they are found in Quebec, Ontario, Manitoba, and British Columbia. However, keep in mind that they are often planted ornamentally, so they are likely found outside this range. It is common to find crab apples in parks, boulevards, in front of businesses, in yards, and other city scapes. In the countryside, they often grow in fields, hedgerows, and abandoned homesteads. There are ten native species to the US, and one is native to Minnesota— the prairie crab apple (Malus ioensis). It can be found in thickets, forest edges, and grassy openings. Crab apples growing along the Midtown Greenway in Minneapolis. About 25 species of crab apple grow in the US and Canada, and they can be difficult to tell apart. There also exist hybridized varieties, which further confuses species identification. Thankfully, it's not necessary to distinguish the actual species; identifying the Malus genus is sufficient. The following guide refers solely to those trees within the Malus genus, not other species whose common name may include the words "crab apple" but belong to a different genus. Crab apples are large shrubs or small trees, generally 15 to 30 feet tall. Bark is scaly, non-striped, vertically cracking, and grey, brown, or reddish. Thorns may occur, but only on older wood— not on twigs. Thorns typically bear buds or leaves. Leaves are oval-shaped, have fine toothing, and grow alternately on the branch. However, leaves often grow on spur branches— stubby little branches with densely crowded leaves. These can make it seem as though the leaves are opposite or whorled, but don't be fooled! Examining regular branches on the same tree will determine whether they are indeed alternate. Crab apple tree in winter. Note the flaky bark. The flowers of crab apple appear in spring, and are five-petaled and showy; hence, the reason they are often used in landscaping. They come in a variety of colors, from red to pink to white. The fruits ripen in fall, turning yellow, orange, or red, depending on the species. Size varies, but they are typically smaller than two inches. Each fruit contains several small seeds. A five-pointed sepal may be present on the bottom (like in a domesticated apple), but often if falls off before reaching maturity. Crab apples are most likely to be confused with other members of the rose family, notably wild plums (Prunus spp.) and hawthorns (Crataegus spp.) Fortunately, the fruits of both plants are edible, so if you do mistake them, it's not a huge deal. You may be wondering how someone could confuse wild plums with crab apples, but it's really not a long shot. The trees, leaves, and flowers all look similar. (Note that there is variation between wild plum species; the link is specific to Prunus americana.) The fruit itself is yellow, orange, or red, and small— typically 3/4" to 1 1/2" in diameter. However, the trunk of wild plums often display horizontal lenticels, which are not found on crab apples. Furthermore, the fruit contains a single large seed, whereas crab apple fruits are several-seeded. 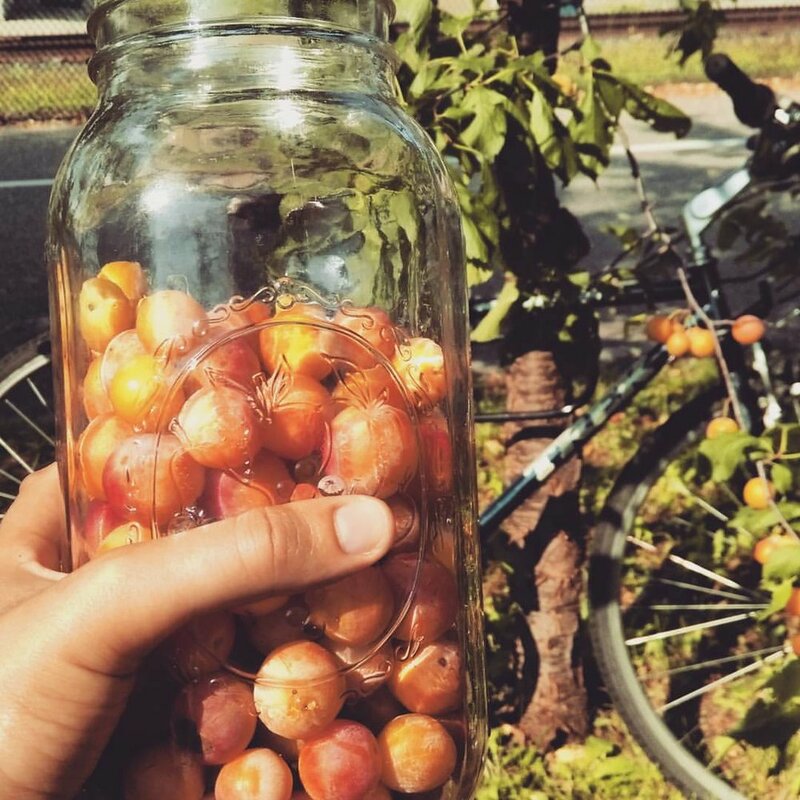 Harvest of wild plums. Note the horizontal lenticels on the trunk in the background. Hawthorns are a bit trickier to differentiate from crab apples. Trees, leaves, flowers, and fruit all look similar. (Note that hawthorns are a highly variable species; they can look considerably different from the images in the link or the image below.) However, the winter buds of hawthorns are nearly spherical, whereas those of crab apples have pointed tips. 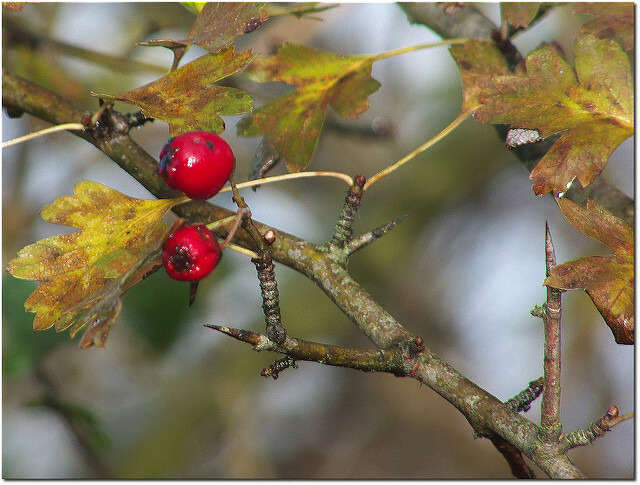 Furthermore, hawthorn has long and slender thorns (up to three inches in length) which rarely have buds or leaves. They appear on twigs as well as older wood. 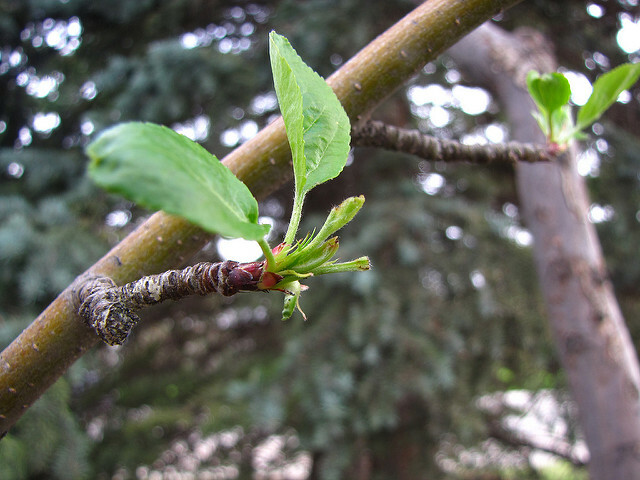 Crab apple thorns appear only on older wood, and usually bear buds or leaves. Thornless hawthorns do exist, however, so this isn't always a reliable identification method. Hawthorn berries sometimes have a dry, mealy texture, which can help distinguish them from crab apples. But some have a juicy, crunchy texture with a bitter-sour flavor much like crab apple. My personal opinion is that if it looks like crab apple and tastes like crab apple and is safe to eat, then eat it! Crab apples typically appear on the tree in summer and ripen in fall, but the best time to pick them is winter! Freezing temperatures make the crab apples soft and sweet, so they taste better when it's cold outside. Alternately, you could pick them when ripe in fall and stick them in your freezer for a couple days. Regardless, make sure to taste test along the way! There is considerable variability from tree to tree, and you don't want to waste time picking something that tastes awful. A pretty harvest of crab apples. This fruit is simple to harvest; all you need is your hands and a container. Typically the branches are low enough that you don't need a ladder, though a step stool may be helpful with larger specimens. Crab apples often fruit prolifically, so it's easy to fill up your basket in a short amount of time. Larger crab apples are more efficient to pick, but if you can only find small ones and they taste good, I say go for it! The easiest way to prepare crab apples is with a food mill. Start by gently washing your fruit and patting dry with towels. Freeze as described above if they haven't already been frozen on the tree by cold weather. Freezing softens the fruit so as to make cooking unnecessary. Simply run through the food mill as is. 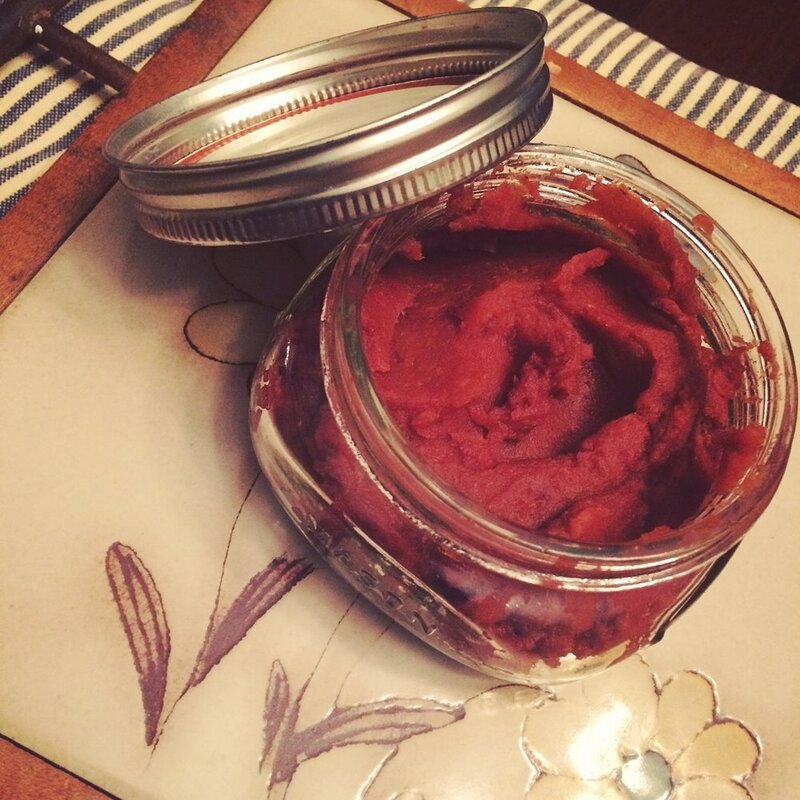 The resulting paste has a texture similar to apple butter. If sweet enough, it can be eaten as is, but it will probably require brown sugar, maple syrup, and/or honey. Apple pie spices like cinnamon, nutmeg, and cloves are also a tasty addition! Eat as you would apple butter. Crab apples are naturally high in pectin and make excellent jelly. They can also be used for fruit leather, pie filling, syrup, and other treats! A simple internet search will provide many recipes. Crab apple seeds contain amygdalin, a compound which, when broken down in the gut, can turn into cyanide. And we all know cyanide is poisonous, right? So logic would follow that crab apples (or the seeds at least) are unsafe to eat. However, this is generally not true. Amygdalin is found in many domesticated foods, notably members of the rose family. This includes apples, cherries, plums, almonds, and more. (It also includes the wild fruit hawthorn described briefly above.) You would need to thoroughly chew and swallow at least 150 apple seeds before experiencing any negative effects. (Apple seeds swallowed whole usually pass through the gut undigested.) A small number of children have fallen ill from eating too many seeds containing amygdalin, but this is extremely rare. Scientific studies show that "levels of amygdalin as reported do not present a food safety issue, though periodic monitoring might be sensible." I couldn't find any scholarly articles reporting levels of amygdalin in wild species, but reason follows that unless you're throughly chewing or grinding massive amounts of crab apple seeds and eating them, you will be fine. If you are concerned about it, simply spit out the seeds or process them out with a food mill or sieve. Now that you have the information you need to identify crab apples, get out and start looking for them! They abound in many urban and rural environments, and chances are that there's at least one growing near you. Even if the tree is bare of fruit at this time, learning to spot them now will help you considerably come fall and winter. They are a tasty treat well worth pursuing!